Here's the fruits of our grocery trip Friday night. (Did I mention how much H loooves to have me all to himself?) Here's a lovely scarf I found at Target. I'd wanted a new one for my favorite purse (the summer purse) for a long time (wanted one all last summer and never got to it). 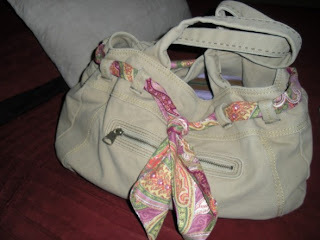 It came with a brown leather strap tied around it , which was OK, but a colorful scarf is so much better. I LOVE the pattern and the colors, and it has a lavender that perfectly matches the lining. And it was on clearance for $3.50. How great? Here's our new lunch bag, from the one spot at T. (Actually one of those $2.50 items...) It's big and wonderful for toting around our water bottles and sammies to the park. (SO much cuter than the plastic bags I had been sporting... I love the pattern! 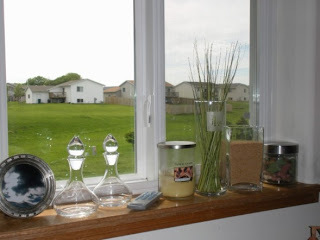 I snagged some onion grass (fake, of course) to replace the pine cones in my favorite vase, (the pine cones were left over from Christmas....we moved. forgive me.) I also found a cute little round frame, and those oil and vinegar bottles were $3.74 at Linens N Things. 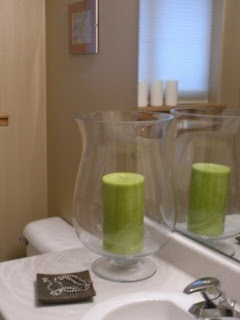 Oh, and there's some sand in the rectangle vase. I love it. So summer-y. 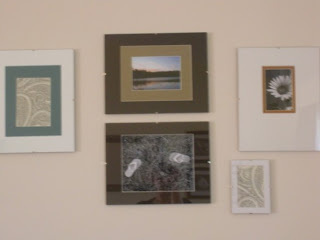 Here's a new set of pictures in my living room....wouldn't they look great with butter-yellow paint behind them???? ...... They've got the summer-theme going on. I loooove to change things with the seasons, because they are so drastically different in SD, it's fun to move with them. 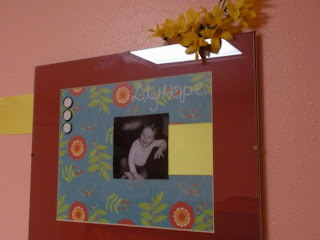 I can arrange these frames in different ways with each season, and change out the pictures and mats too- so easy to do. Everything I needed for this project was half off at Hobby Lobby this week. Woo! When I got this stuff, I got mats etc for fall, Christmas, and "Normal Time" too. SO fun. Sorry this picture is blurry. I didn't notice until the upload. Like, the mat around the sunflower is orange- You get the idea. I love this print- .25 baby. (It's scrap booking paper). 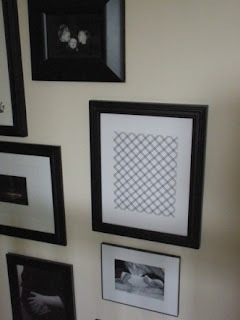 I didn't do Money Monday- will this decorating tip be a fill-in? 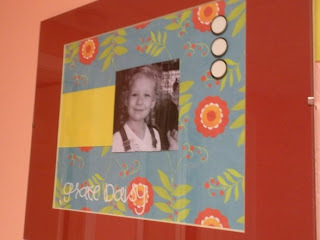 Put anything behind glass- fun fabric from the store or a shirt at Goodwill, or even SB paper like this- and you have some interesting, cheap art, to change things up on your walls. 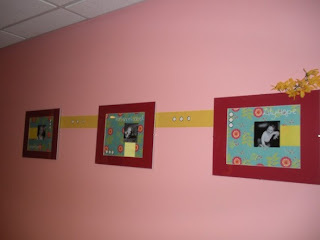 Here's some more SB paper, I looove how it breaks things up on our picture wall going down the stairs. Wait, I loved it so much I put it here, too. 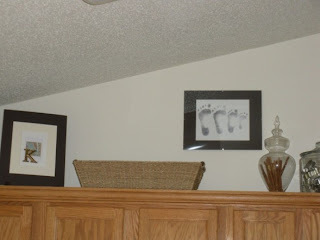 I finally hung the kids' feet prints I made last fall. Oh, and I got some fun yellow mats for these. (For those who asked, these were done at the fair last summer in Rapid City. They were made by a man who trained with artists at Disney when he was young. 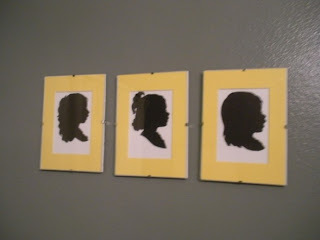 All he does is have your child sit in a chair, he looks at them a couple of times, and CUTS these straight out of a piece of thin, black paper. Then they put it on a 5x 7 piece of card stock for you. All in about 5 minutes. Amazing. All free, too. I love them. I put this on my desk. I loooove fun colorful prints. 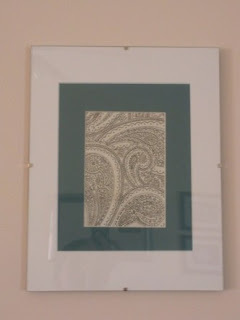 I also love paisley... just do. 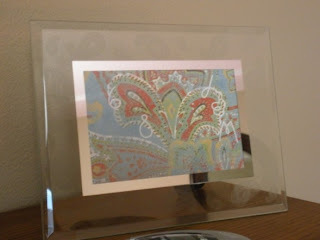 This frame was $5 on clearance at Hobby Lobby (can you see the etched paisley pattern?). Oh, I love it. 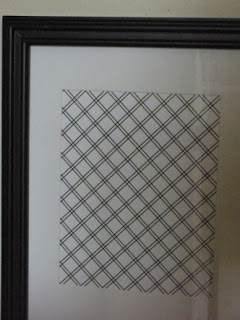 The paper, which is framed in my master bathroom now too, was again, .25. There's a hidden 6 8 and J & M in there. Do you see it? (Leftovers from a project below). 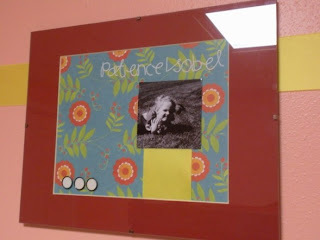 And I FINALLY have something on the walls of the girls' room. The place is still desperate for a trip to IKEA, but that's not happening until July. Until then, I'm loving how these turned out. 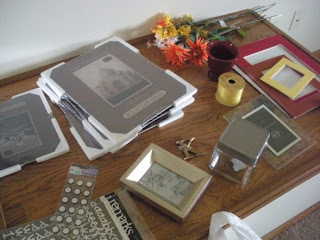 Again, .25 paper, some stickers, mats for $1 (half off at HL) and 11 x 14 frames for $2.50 (half off too). I love them! Great thing? When I'd get home from hunting and gathering (shopping) I could throw my stuff wherever I wanted! 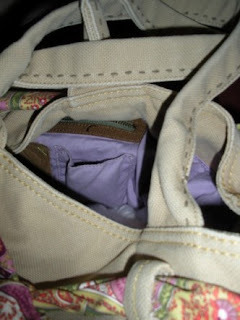 I'd throw my purse on the bed, too, just because I could, and NO ONE would pick it apart or move it! So nice. Well, I missed them too, but, the break was wonderful. 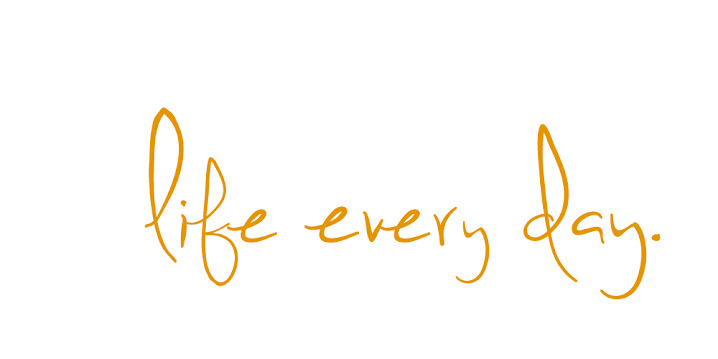 Today, life is normal. The house is all summerized. We're ready to tackle a new week. The weather? Cold and rainy. Well, I had to do laundry anyway. I could use a weekend like that soon! Rain, rain, go away! I also love paisley! My favorite sheets as a child were red paisley...ahhh memories! ;-) Sounds like you had a super relaxing weekend! I bet that was really nice for Hudson! They all need that Mommy time on occasion. I love your lunch bag. 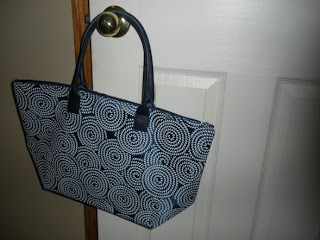 I have a tote from Lands End that I use and love. Nothing better than a big bag! 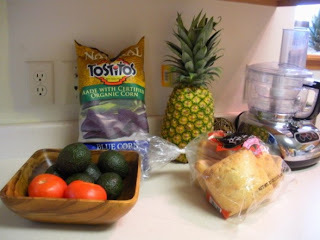 Those avocados look goooooood! Terrific! I'm amazed you got so much done & still took care of the baby! I like it all, but I especially love the pink & red! I especially liked your post about your oldest turning 5. We'll be there in a couple months, and I'm sure I'll be thinking and feeling many of the same things. You are seriously talented. Seriously - love everything! Oh...to have a couple of days all to myself. It sounds beyond fabulous! It looks fabulous...all of it! Hope you and Hudson had a great weekend of bonding! A WHOLE weekend spent with just the baby?! Sounds like you enjoyed it fully! I love your house! 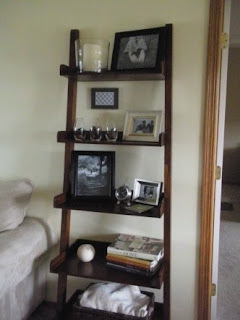 Parts of it look straight out of the pottery barn catalog!